Farmstead Table is a small farm-to-table restaurant, tucked away on Union Street in Newton Center. 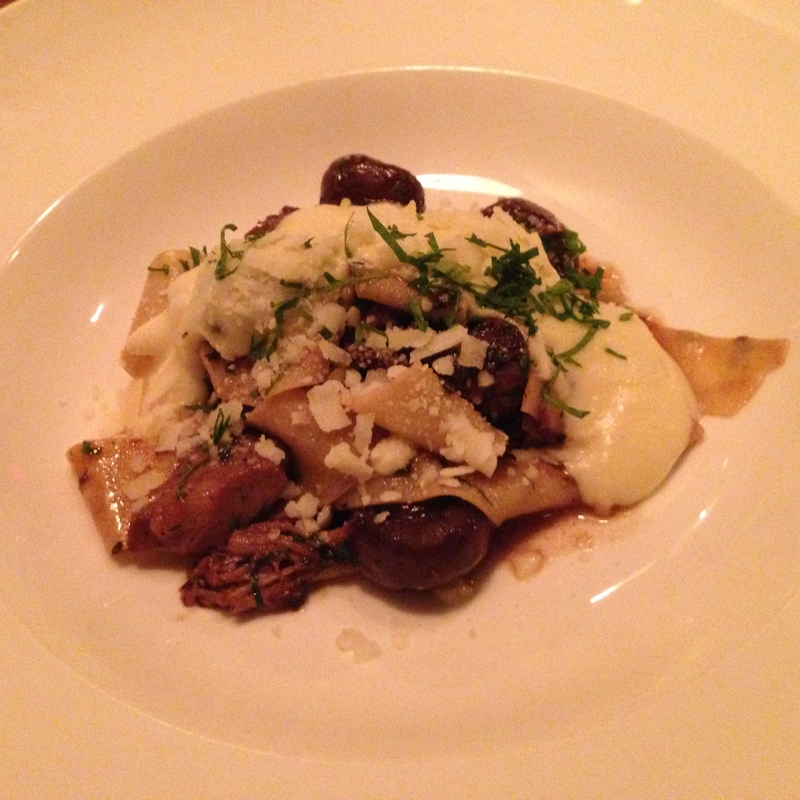 The menu is constantly evolving based on the local and seasonally available ingredients. Which means you can go back every couple of months and always have a variety a of new items to chose from 🙂 Although I hope it doesn’t change too frequently, because there were about 4 entrees on the menu that I desperately wanted to try. The three I missed out on: Lentil and Sweet Potato Stuffed Cabbage (shiitakes, celery root puree, roasted carrots mutsu apple); Grilled Scottish Salmon (sweet potato puree, roasted cauliflower); and the Halibut special that came with butternut squash two ways (puree, roasted), and roasted brussel sprouts. I try not to repeat restaurants since there are so many I want to try, but I may be heading back to Farmstead Table sooner rather than later. Thick slices of bread was served, one for each of us. 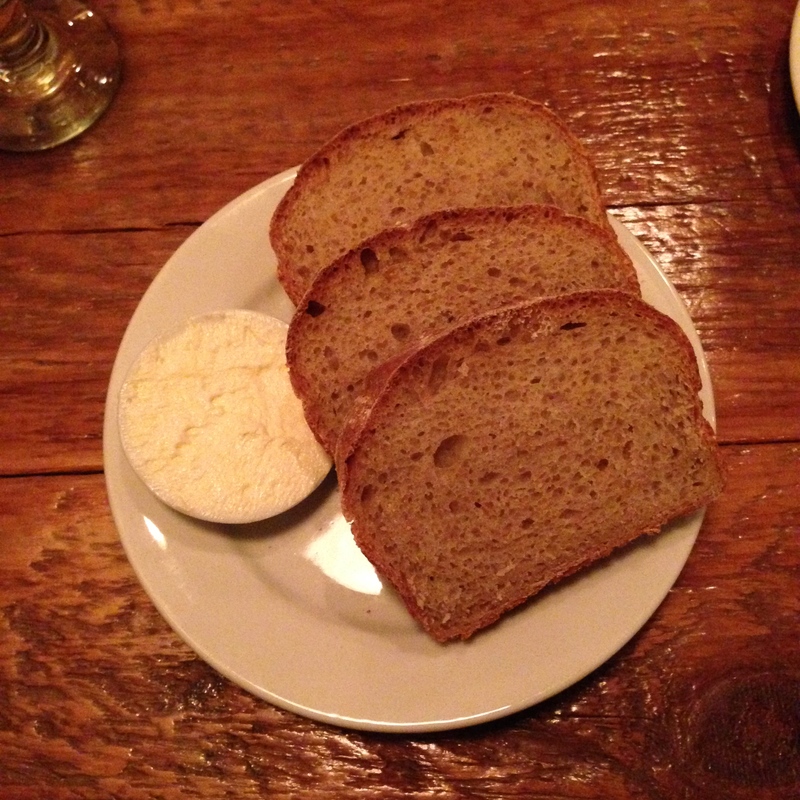 It tasted like a subtle rye and was served with whipped softened butter. 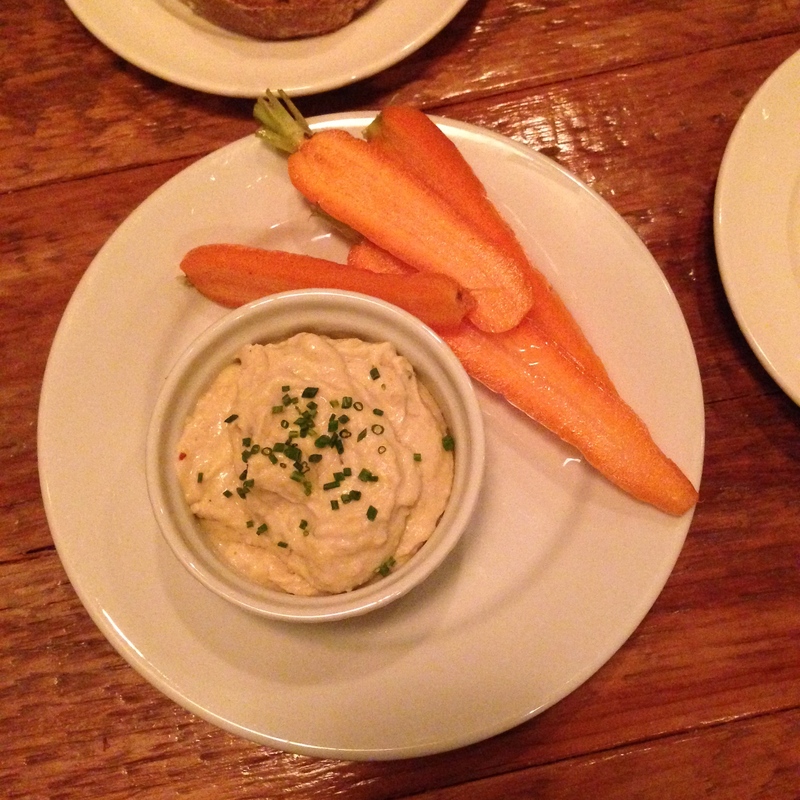 Luckily the hummus came out soon after the bread; it is served with only a few slices of carrots which is not nearly enough for the amount of hummus that was given. More crudités please! We fortunately spread some hummus on our bread, which was perfect. I have trouble resisting soup, especially any kind of vegetable puree. 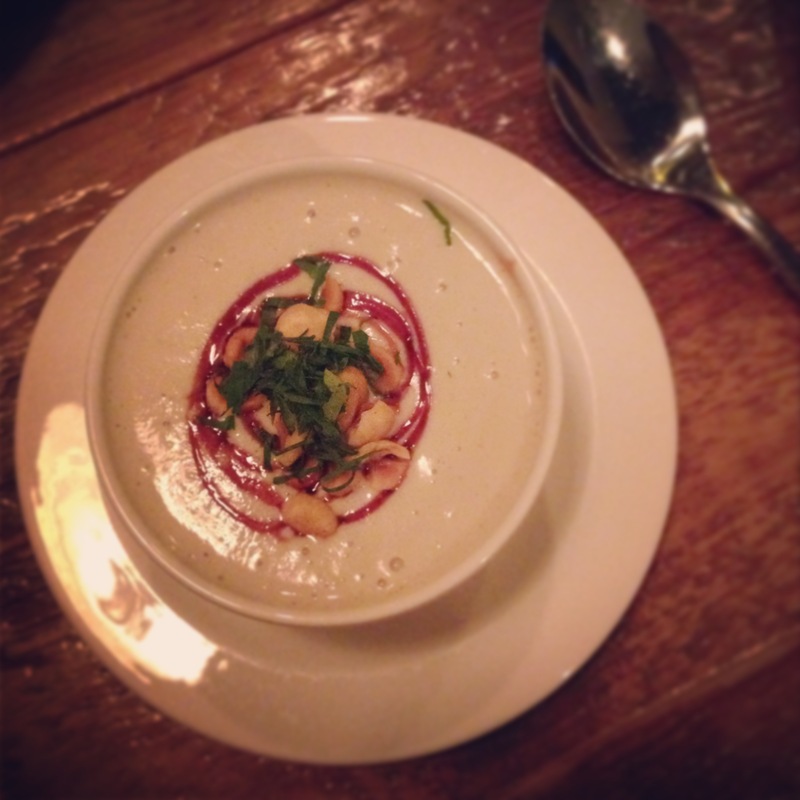 This cup of parsnip soup was a great start to the meal; extremely smooth with hazelnuts for crunch and texture. I’m glad I didn’t miss out on this one. I also have trouble resisting pasta. However, this was the perfect choice for me, because I wasn’t hungry enough to have hummus, soup, and a full entree. Luckily they offered a 1/2 portion of the lamb shank ragù. The $14 price was a little steep for the small appetizer size, but it was really good, so I don’t mind paying for a good quality meal. There was plenty of lamb and mushrooms in the dish, I just wish there were a few more noodles! I forget exactly what was on the dessert menu, but I do recall seeing a line about S’mores that I tried to avoid looking directly at. If I read the full description I’m sure I would have forced myself to order and eat the entire thing. I scanned the rest and definitely saw at least 3 options that I would have had in a heartbeat, but I was honestly stuffed to the brim. Oh well, maybe next time! The prices at Farmstead Table are moderate for Boston/Newton; all entrees were in the $20 range, with the Rib-Eye Steak taking the top spot at $29. The appetizers were a little pricer as apps go, $8-$14. I drank only water but my friends noticed that the wine was pricey (I think the least expensive choice was around $14). The service was great, our waiter was attentive, refilled our water, checked on us an appropriate amount of times. The interior is warm, cozy, and welcoming. And most importantly, we all absolutely licked our plates clean! I look forward to going back soon. The Perfect Bite: fork full of pasta with lamb and a cut of mushroom!